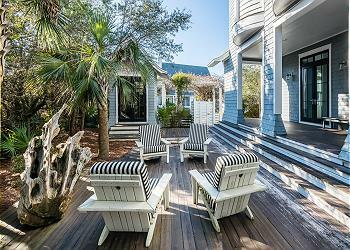 DETAILS: “3 Bunch Palms” is an incredible home situated on a stunning nature preserve in the Peninsula of WaterSound. Featuring 4 bedrooms (2 master bedroom suites), 4.5 bathrooms, and exquisite accommodations for 8 guests, this luxurious property showcases an extraordinary collection of original art, has been featured in House Beautiful magazine and on HGTV, and is just a short walk from the sparkling Emerald Coast! A modern spiral staircase leads to an open-concept floorplan on home’s second level. The chef’s kitchen boasts gorgeous custom St. Charles cabinetry, granite countertops, and top-of-the-line Viking stainless steel appliances—an incredible place for any home chef! The nearby dining area offers spacious seating for 8 guests. Plush furnishings, soaring ceilings, and large windows make the living room a bright and airy place to relax. Four guest bedrooms offer a variety of sleeping arrangements all with private bathrooms. The unique layout of the home offers two large private master bedroom suites with luxurious king beds and en-suite bathrooms complete with double vanities and walk in showers. One master is located on the second floor and one master is on the first-floor level. Plenty of private space for the adults in the house. On the first floor is a third bedroom with 2 single beds that can be reconfigured to make a third king bedroom. This room is great for younger guests or adults depending on your needs. The third bedroom has a private bathroom with a shower/tub combo. A beautiful back porch and sitting area is outside the door of this bedroom. The fourth bedroom on this level features abundant natural light from the surrounding transom windows, a comfortable queen sleeper sofa, private bathroom with a shower. This room also doubles as a spectacular media room and offers a flat screen television and plush chairs—a wonderful place to enjoy a family vacation movie night! Spacious and ultra-private balconies offer incredible emerald coast views. The expansive covered outdoor porch is conveniently located just off the home’s kitchen and features a Viking gas grill and an outdoor dining set for 8 guests—the perfect setup for dining alfresco. This tree-lined property provides a quiet and private place of serenity for the getaway of your dreams. WaterSound’s sugar white sand beach is a short walk down the boardwalk. Two beautiful community pools offer a refreshing place to relax and enjoy a day of fun and sun. This home features four custom 360 Blue adult beachcruiser bikes, which offer a wonderful means of transportation and a breezy way to see all of the wonderful sights and sounds of our 30A communities. Don’t miss out on this stunning, one-of-a-kind WaterSound home. Contact 360 Blue to book your stay at 22 Creek Bridge Lane today! House was great and we love Watersound. We have been coming here for the last 8 or 9 years. However, we were very disappointed that our bikes were flat most of the time and could never get that resolved, we had to drive to the beach club somedays. Location was not ideal. Also, it was very disappointing that they picked our week the week to do maintenance on the home. Dishwasher was being serviced at 5:00 in the afternoon, right when we are trying to get in from beach and even worse, the last day we were there we had no air in our house all day. Heating and cooling people were there for 5 - 6 hours. Therefore, we decided to leave a day early. I feel that was very poor planning and disappointing to say the least. Especially the last day. I expressed my concerns that afternoon but no one ever called me back. We are so glad that you all had yet another wonderful stay with us in Watersound! We look forward to seeing you again soon! We visited in July 2009 and had a wonderful family vacation. There were 2 adults and 6 children and there was plenty of space for all of us. From the beginning, Peter was wonderful to work with. He responded quickly to booking questions and made the entire process seamless. The house is amazing. FIRST CLASS ALL THE WAY. We especially enjoyed the bicycles that are provided. Such a quiet community. We also took advantage of the Beach Club and were so glad that we did!! Thank you for an amazing vacation. We are looking forward to returning in 2010! My family and I traveled to Florida from Oklahoma and were thoroughly pleased when we arrived at the house in Water Sound. It had beautiful views, comfortable rooms and it was really quiet...the perfect break from our schedule at home. The owners were gracious and allowed us to use everything! The bikes were great fun and we even joined the club for the week so we could enjoy the pool and club house for meals. It was a perfect get-away. This house was ABSOLUTELY beautiful! The decor was exceptional and everything was very clean and comfortable. It was perfect for our family. Plenty of room for everyone to have their own private space. The pool and beach was a little further than we anticipated, buy trails made it accessible. We had a lovely time! We are surrounded by a dune lake which is about 100 yards away and the Gulf is just beyond that. It is a short but very scenic walk on the boardwalk across the lake to the nearest pool and the beach. You can also drive 2 minutes to the pool or Beach Club where parking is never a problem. My family stayed here for a week last summer and had a wonderful time. The house was accurately shown on the web site and it was very comfortable for the adults as well as the kids. The owners have created a beautiful place to relax and enjoy the scenery of the dunes and Gulf. We all loved Watersound and hope to return next year. We had two families who stayed in the house in late July. This was our first visit to WaterSound, though we had been to other nearby properties in the past. We really enjoyed the home and found the community as a whole to be a great place to unwind. The owner was always quick to answer questions and called to check on us after we arrived to make sure we were settling in well. This house is located close to the lake, which was great for us as we took the kids fishing and crabbing several times while we were there. The nearest pool was also perfect for us, it wasn\'t crowded and we could take our lunch goods down to the adjacent pool house and then use the kitchen to prepare lunch. We usually packed our trucks and drove the short drive to the pool, rather than walking. Then we left some things at the pool while we went down to the beach, and then came back to the pool before heading back to the house. We felt comfortable letting our kids ride bikes and explore around the neighborhood of nice homes. At the house, all the decks were great for some \"away\" time late in the day or early in the morning, and our kids found the downstairs living area to be a good spot to get away from the parents while we visited in the upstairs kitchen/dining area. We all left earlier than we wanted to and had a great time in this beautiful home. If you are entertaining at the beach or want a place to take your family for the holidays this would be a great home for that kind of stay. We\'ve stayed in South Walton for the last six years on our summer holiday. Usually we go to either Watersound or Blue Mountain Beach. The resort itself is very high end, the service is impeccable. (Pay for the beach club. Fantastic food and drink. Danny and Dave will see to it that you never want to go home.) Generally we do not have concierge service, which was available with this property. I appreciate the owner offering the service and they were there to greet us when we reached the door. The pros for this house are, it really is incredibly beautiful. The kitchen has won awards and with good reason. While it is not large, it FEELS large due to the open concept living area. The house is full of natural light and very soothing with miles of covered porch and decks with comfortable chairs. The master suite we stayed in had a very comfortable bed, nice linens, beautiful art and a ceiling fan that was whisper quiet. (Might not seem important but in a house with vaulted ceilings it counts for a great deal!) The owner left a few things for us to use in the pantry. (I truly appreciate not having to run out and buy every spice in creation when I am on vacation so that I can cook!) Also, the wine cooler was a very nice touch. The bathrooms, all of them, were high end, modern and spotless. The \'family\' bathroom off the media room is remarkable and was deemed the favorite by my 24 year old daughter who claimed it quickly. There is shaded parking under a pergola covered space. The owner was easy to deal with and communicated regularly. He also checked to make sure we had arrived and were comfortable. The only additional information I think I traveler should have is that this house is not beachfront and three new homes have now been built partially blocking the view. The owner did tell us that there were houses there so the view had changed before we rented. The walk to the beach is five minutes (we timed it and were moving at a good clip). 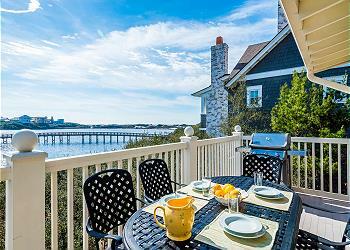 If beachfront is not important to you then rent this home before anything else at Watersound. Take your family and enjoy a great stay. Beautiful house. Not on beachfront but nice walk to beach. Quiet neighborhood not busy with tourists. House has everything you would need and then some. Very nice bikes come with house. Beach club not necessary but very nice add on. Guests will need car. Matching master sites great for girls trips. Third bedroom has two twin beds that are very comfortable!! Fourth bedroom has pull out sofa. Every room has very nice bathroom attached. 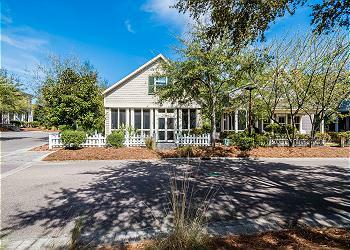 You will not find a nicer house on 30A for price. If you have small children do beach club and use car to drive there. This beautiful home became the backdrop for our first family vacation with our one year old son. The house is really spectacular with a countless number of high end finishes. We have stayed in a number of houses along 30A and in Watersound (various neighborhoods) and this house is by far the best maintained we have ever rented. The kitchen is amazing and the pool and beach are within close proximity. The owner is probably the very best we have ever rented from in our experience. We had to delay our arrival by one day due to a death in the family and he was fantastic to work with- and even checked on us during our stay to make sure everything was going well. This house will definitely be at the top of our list for future trips!! We stay in Destin every year and decided to try something different. What an awesome week away from the traffic and congestion! The house was amazing for the 8 of us, from ages 12 to 72. The beach was perfect - clear blue water, white sand, no crowds, sunsets, and crab hunting at night. We plan to stay here every year! My family has visited the 30A/Seaside/Rosemary Beach area at least once each year for the last 6 years and this house was by far the most amazing place we have stayed. You simply will not find another location as well-suited as this place for a beach getaway. The house and gated community have access to multiple pools, a secluded beach, walking/biking paths, outdoor activities, lakes, and the area\'s many great eating spots. The house itself is incredible - multiple porches, Viking appliances, walk-in showers, and the most amazing video/audio/lighting set-up that I\'ve seen. I highly reccomend this place for couples or families of all ages. This was a great house for our family of four + mother-in-law. We had lots of room and loved having separate patios and indoor living spaces. During afternoon rest times, everyone had their own space to read, watch TV, nap. The kitchen and dining area were great...open concept, making family meal times easy. Daily staples (e.g., salt, sugar, dishwasher detergent) were available for use, which is immensely helpful in avoiding grocery purchases that will just be tossed at the week\'s end. The owner was very responsive, before and during our stay. A toilet was running upon our check in, and the home\'s caretaker quickly scheduled their handyman to come to the house. All were very friendly and professional. Our family rents a home a few times a year. It is a disappointment when your vacation is spent in a home that is not as nice as your own. I would be surprised if anyone felt this way about this home. It is a luxury beach home! So glad you loved it. All of our guests seem to feel that way but it is always great to hear the details. Thanks a lot! Our second visit to this beautiful home. Owners & Julie very easy to work with. Home fully stocked with anything you might need. Great location & quiet neighborhood. Highly recommend! The house and neighborhood are picturesque. The house is roomy and comfortable, and is great for a family vacation spot. Really loved the Viking appliances. The walk to the beach is a bit long, but when you get on it, its like you have your own personnel beach without all the people. We enjoyed evening walks around the lake. The area has a lot of quality restaurants and things to do. We recommend this property. We loved the house and the neighborhood. We are so glad! Thanks for staying with us, we hope to see you again soon! This was a roomy, very comfortable home with many amenities and tasteful furnishings. The common upstairs living, kitchen and dining area were a perfect family gathering point for the home, yet the bedrooms, downstairs den, and multiple porches provided ample space for privacy. The boardwalk and bridges to the beach around the lake were well planned and placed and was a great pleasure to take this nice short stroll each day. The lake provided additional opportunities for quiet and peaceful paddle boarding and kayaking. The beach itself was on a peninsula, also quite private, and we were able to locate our chairs and umbrella at least 100 yards away from any other beach chairs. So, this house has all the custom features ever needed, yet it has options for privacy both within the home and at the lake and beach. It is a welcome respite from the other usual overcrowded and chaotic C30-A resorts and properties. We are so delighted that you enjoyed your stay with us in Watersound! We agree that this home is is perfectly accommodating on many different levels and is a great spot to sit back and relax! Thank you for visiting, we hope to see you again soon! The home is very nice and in a terrific location. It has all the amenities that anyone would want. Kitchen is well appointed and stocked with top of the line utensils, plates and glassware The walk to the almost private beach is about 10 minutes. Overall, it was a great respite out of the Independence Day madness at Seaside and Rosemary Beach. Thank you for the great review. The walk to the nearest pool is a very scenic 5 minute walk on the boardwalk along the dune lake and the beach is 2 minutes beyond that.